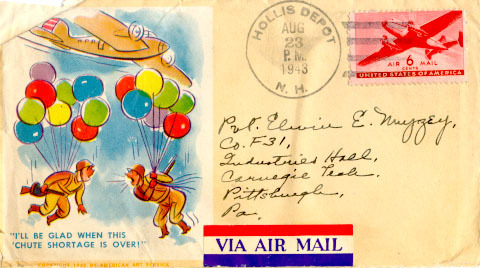 Elwin Eugene Muzzey was born February 16, 1923 in Hollis Depot, now part of Nashua, New Hampshire. In February 1943 he enlisted in the Army Air Force and was assigned to the Army Specialized Training Program, attending the Army Air Forces Technical School at Central State College in Edmond, Oklahoma. He spent the war on various Air Force bases in the U.S. and, for about six months after its end, in China. In April 1946 he received an honorable discharge from the Army Airways Communication System Squadron with the rank of Sergeant. After the war, Muzzey attended the University of New Hampshire (1946-1950), majoring in Business. After graduation, he worked first for Horne's in Pittsburgh, Pennsylvania, and then for the Rike-Kumler Company in Dayton, Ohio, both retail department stores. In April 1952 he married Virginia "Ginny" Schlimmer, a beautician at Rike's beauty salon. Before his retirement, Muzzey operated an antiques business for many years. He lives in Hubbard, Ohio. 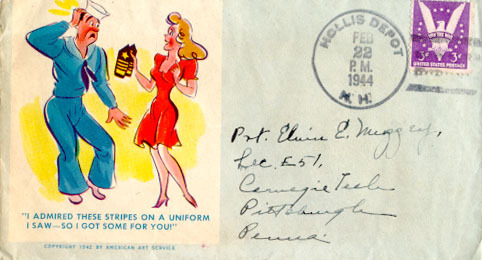 The Elwin E. Muzzey collection consists primarily of letters written during the years 1943-1946 while Muzzey was stationed in the U.S. and briefly in China. 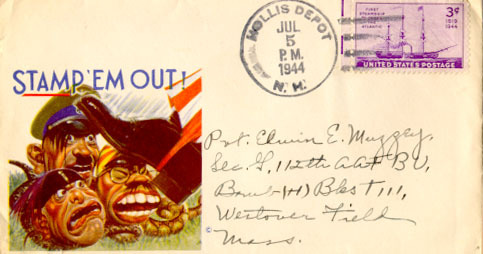 The majority of these letters are from Muzzey to his parents (Series I, Boxes 1-3), and from Mrs. Fred Durgin, Muzzey's mother, to him (Series I, Boxes 4-5). 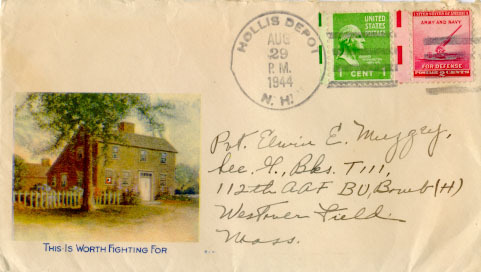 Additionally, there are letters written to Muzzey during the war from family members and friends, some of them also in the service (Series I, Box 5). 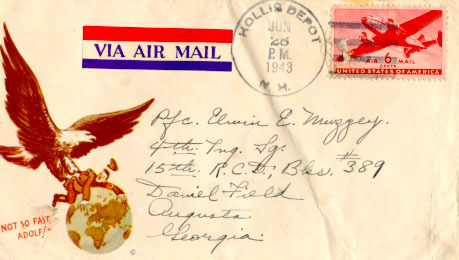 Letters written by Muzzey to his parents from the post-war period - from UNH (late 1946-early 1950), Pittsburgh, Pennsylvania (late 1950-May 1951), and Dayton, Ohio (May 1951-1956) - are in Box 3. 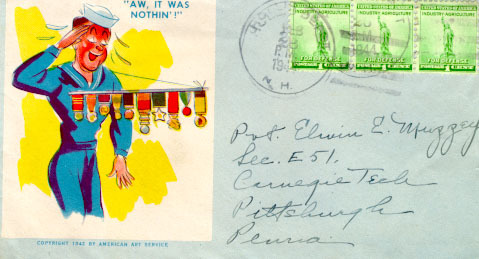 The collection also contains a small number of other items, including army documents, a 1950 UNH Tau Kappa Epsilon photograph, and Asian guide books printed by the U.S. War Department for military personnel. 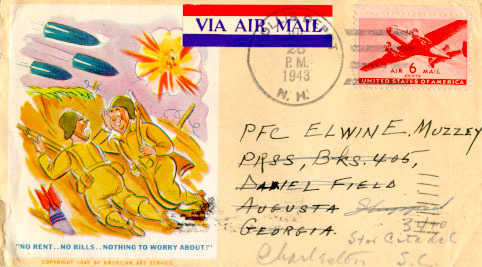 Of particular interest are the illustrated envelopes used to send mail to the Armed Forces during World War II, of which there are 64 different designs in the collection (Box 6). A similar collection held within Milne Special Collections is the Maurice E. Bowes Papers (MC 245). [Identification of item], [Folder Number], [Box Number], Elwin E. Muzzey, MC 172, Milne Special Collections and Archives, University of New Hampshire Library, Durham, NH, USA. Box 6, Folder 9 "What You Should Know About China"
Box 6, Folder 11 "A Guide Book to Calcutta, Agra, Delhi, Karachi & Bombay"
"I'll Be Glad When This 'Chute Shortage Is Over!" "No Rent..No Bills..Nothing To Worry About!" "Shoot Some Ink This Way - For"
"This Is Worth Fighting For"